In my article today, I will concentrate on listing the 6 Best WordPress Blog Themes which you can pick up any of them without any doubt. 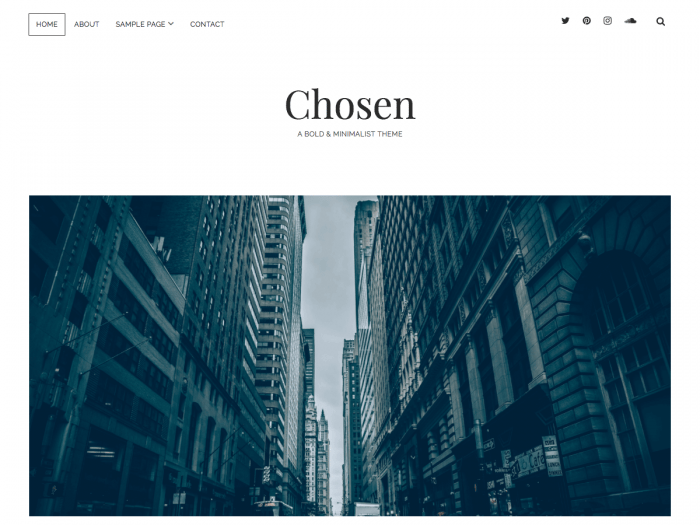 Chosen is a sophisticated and minimalist blog theme. It features large, expansive images making it suitable for media-rich sites as well as personal blogs. If you publish frequently, Chosen may be a good fit for your site thanks to its multi-column layout. Easily showcase many of your latest posts whether you’re an infrequent or daily publisher. This blogging theme is fully responsive, so it will look and perform great on desktop and mobile devices. Strong use of typography and a mix of serif with sans-serif fonts provides Chosen with a modern, yet classic look. The aesthetic matches a few niches especially well including fashion, food, and lifestyle. Chosen comes with a handful of useful features, such as custom logos, a built-in search bar, over 50+ social media icons, and more. 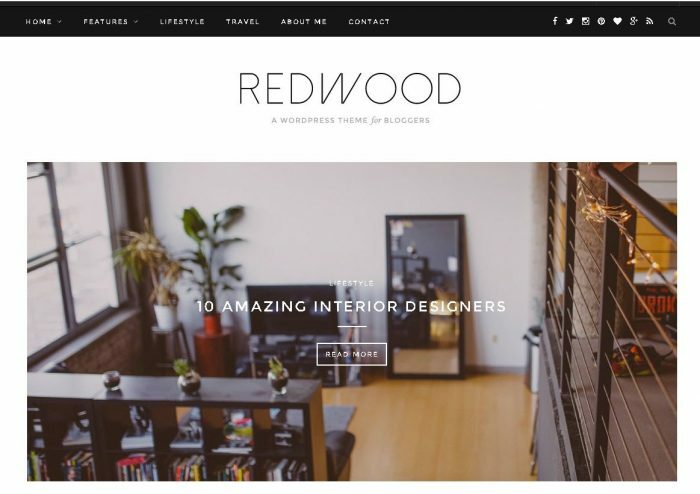 Just been developed in June 2015, however after some months of release, Redwood is now one of the best seller WordPress Blog Themes with more than 1700 sales. The classic and clean appearance impresses your audience and brings specialty for Redwood. Coming with five different blog layouts: Classic Blog Layout, Grid Layout, 1st Full Post then Grid Layout, list Layout, 1st Full Post then List Layout in which full-width version of each layout is included, you can easily choose how your posts are displayed. Besides that this WordPress Blog Theme also packs beautiful featured sliders with three useful Promo Boxes below the slider. In addition to that, Redwood also supports a range of widgets and plugins such as Custom Styling for MailChimp, About Me, Facebook, Social, Latest Post, Instagram widgets; Contact form 7 plugin. Specially built for bloggers, there are various types of post formats for you to choose: regular posts, full-width posts, video posts, gallery posts, music posts. Although Redwood does not support any page builder or Revolution Slider, it is a wise choice for people who prefer an easy to use WordPress theme. Moreover, the price of 39$ is so worthy among other WordPress Blog Themes. 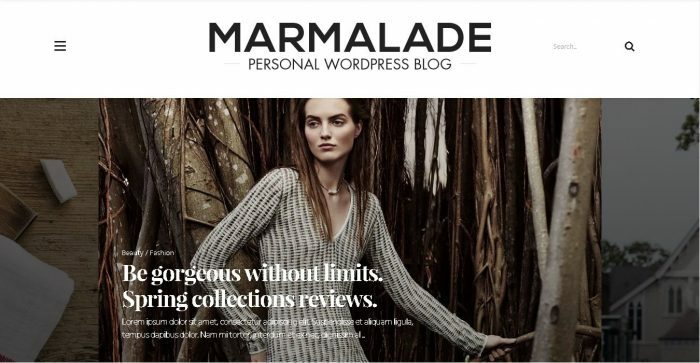 Developed by Pryanik in July 2015, the Marmalade is predicted to be one of trending WordPress Blog Themes shortly. This Blog WordPress Theme comes with the Master Slider Premium Plugin (19$ value) – a high-quality image and content slider for WordPress with the ability to add any HTML content (texts, images, …) in layers. Besides that, the powerful Contact Form 7 of the Marmalade allows visitors to get contact with you quickly. The Google Map is also optionally included in the contact page to show the location for easier searching. Additionally, the Marmalade offers unique features which can be mixed with other WordPress Blog Themes such as full-width & spotlight post type for maximum interactive and attractive grid, custom category title to add a little authenticity to their categories with user-friendly options, related posts on the grid for your reference, custom post type, etc… This Blog WordPress Theme has an impressive design and is suitable for any blog from fashion, food, art to handmade. You can choose any post: standard post, image post, gallery post, video post, audio post and quote post because they are all supported. On the other hand, the Marmalade is very easy to install with the one-click importer. More than that, the WordPress live customizer also allows you to have real experience before applying any change in settings. There are so many words about the Marmalade WordPress Blog Theme, and you’d better come to visit it. Looking into the demo of Brook WordPress Blog Theme, you will be first impressed by its pixel menu from which you can choose layouts, pages and achieve. The smooth AJAX navigation allows you to make a quick search of posts. Interestingly, you can know how many percentages of a post you are reading via info bar on the top. It is not a big deal for you to distinguish Brook from other WordPress Blog Themes thanks to its light, spacious and versatile appearance which elevates contents in exceptional personal style. This Blog WordPress Theme supports five types of layout: Masonry grid, gallery grid, a list with an excerpt, archive list, a list with full content and four kinds of post format: Gallery, video, audio, quote. Furthermore, the Brook comes with great typography, color, background option and 800+ font icons, and you have so many options to customize your site with different styles. Besides that, it is supported custom cover images, full-width featured sliders, custom widgets such as About Author, Blog Gallery Grid, Blog List, Social Media Links, Instagram. Solopine is a well-known theme vendor with best seller WordPress Blog Themes such as Redwood, Rosemary, Florence, Cassia. Although Redwood has already been 1st ranked in my collection of best WordPress Blog Themes today, the massive amount of more than 5000 sales, 4.85 average rating of Hemlock is a clear reason why I could not deny to put one more theme from Solopine vendor on this list. Hemlock is a straightforward and easy to use theme in which necessary elements for blogging are mainly concentrated to avoid bells and whistles. This Blog WordPress Theme is an ideal place for bloggers to create posts in any field. It supports three types of layout: Standard full-width blog layout, sidebar layout, grid blog layout and four kinds of post formats: standard post, video post, gallery post, music posts. More than that, Hemlock WordPress Blog Theme includes with custom widgets such as: About me to make an introduction, Latest Posts to display recent posts, Social widget, Facebook widget and Instagram Widget to public posts via social channels. Besides that, the social media icons in header and footer also are shown to help make your posts socialization with one click. Read more information and visit the demo of Hemlock and surely you will have no doubt to agree with me. 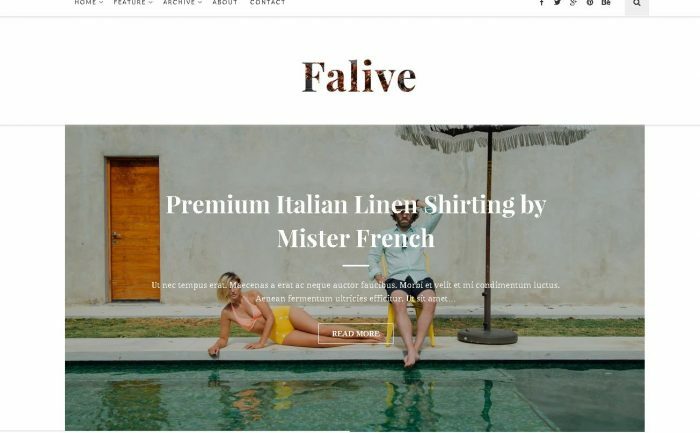 Falive is built with two styles for personal blog and magazine. Each style will respectively have featured options: full-width slider, highlight slider, stack slider and post layouts: masonry, masonry layout, normal, no sidebar for your choice. Search icon of this WordPress Blog Theme is arranged in the header top for visitors to browse your blog’s content which helps them save time to find relevant posts. Falive comes with two types of layout: boxed container and full-width container and five types of headers with a different beauty. Moreover, the related post inside post feature and the pop-up recommended post when scrolling feature allows visitors to find more posts for reference. Additionally, you can share posts via Facebook, Pinterest, Google+, Instagram, Twitter. The Falive WordPress Blog Theme includes Font Switcher for you to choose about 600 Google fonts. It is also supported with translation ready to translate your blog page into any language. There are so much other exciting features you should have a look to see this is one of good WordPress Blog Themes to pay. 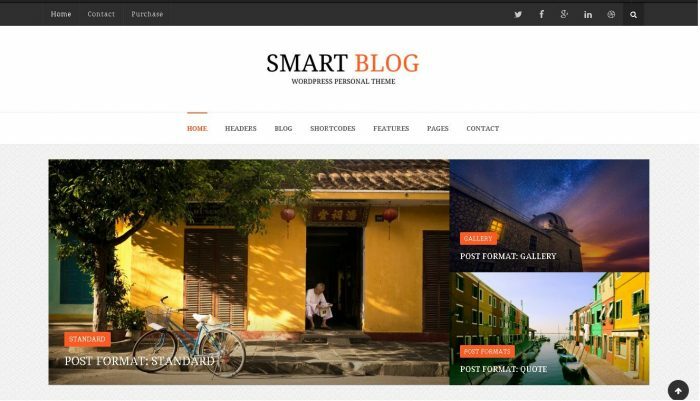 Last listed in the collection of Best WordPress Blog Themes, however, Smart Blog comes with gorgeous and impressive features. Most notably, this WordPress Blog Theme supports 8 types of post formats: standard, audio, gallery, image, link, quote, status, video and 13 custom widgets: Ads 125×125 Widget, Ads 300×250 Widget, Contact Info Widget, Facebook Likebox Widget, Flickr Widget, Instagram Slider Widget, Instagram Grid Widget, Posts(Popular, Recent, Random) Widget, Social Links Widget, Subscription Widget, Slider Widget, Tabs Widget, Tweets Widget. Also, the Smart Blog includes seven home pages, three headers, and six blog styles. Especially, the Shortcode Generator allows you to create tons of useful Shortcodes for elements such as accordions, alerts, audio, buttons, columns, dividers, google maps and so much more. Going along with one-click demo installation, it takes just minutes to install this theme. Besides that, Smart Blog is built on Bootstrap 3 to make front-end web development faster and easier. From the theme options, you can customize the color to the last corner of your site, apply fonts for different elements thanks to 600+ Google Fonts and +500 Font Awesome Icons. Furthermore, dummy child themes included are plus point of Smart Blog among other WordPress Blog Themes. My first impression about Epilog is clean, flexible and it is appropriate to create an interesting personal blog. Coming to Epilog Blog WP Theme premium, you will experience with 6 Blog layouts (all with and without sidebar, List/Grid, Featured article then list/grid and a classic design). Epilog brings more great features than every WordPress theme for bloggers should have. This personal Blog WordPress theme is correctly coded with high quality to earn compact design, optimized loading time and nice animations. Especially, Epilog is programmed with SEO needs in mind helping your site be friendly with a search engine. Besides, many different post formats are supported in your blog to make your personal page different with the others. Developers of Epilog read mind and understand expectation of the bloggers, then the Epilog Blog WordPress theme with full modern functions are created such as: featured article slider, three promotional boxes, Instagram feed, Contact form, HTML5 + CSS3, Cross-browser Support – Tested in IE9+, Firefox, Chrome, Opera, Safari, iOS, Android and Blackberry, W3C Valid source code, properly formatted and commented, responsive layout, load speed optimised, Font awesome and Google fonts integration. This template deserves to be rated as the best Blog WordPress Theme. Epilog Theme offers full support and detailed documentation, so you don’t need to worry about installation and customization. Now the thing you need to do is adding this responsive WP theme for blogging to your collection. We have gone through to see features, the functionality of the 6+ best WordPress Blog Themes. If you want to choose lightweight and easy to use themes, Redwood and Hemlock with the price of 39$ from Solopine is a good selection. And if you prefer WordPress Blog Themes with rich options and customization, you can take a look at Marmalade, Brook, Falive and Smart blog with the price of 44$. For any inquiry or question about these WordPress Blog Themes or other, kindly comment below and I am willing to assist you with my best effort.